In Ferrari promised to show a new model 29 fevrali, and kept his promise. The Italian manufacturer has provided us with the last child who has received the name of the Ferrari F12 Berlinetta. The official presentation of the Ferrari 599 successor will be held in Geneva next week, but we can already say that it is the fastest and most powerful production car in the history of Ferrari. Under the hood, "horse" is located V12 engine with a capacity of 6.3 liters. It produces 740 hp power and maximum torque of 690 Nm, 80% of which are available at 2500 rev / min. The power unit provides acceleration from a standstill to 100 km / h in 3.1 seconds and insignificant from zero to 200 km / h in 8.5 seconds. 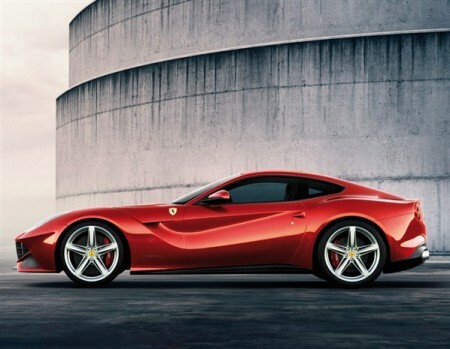 In addition, the new flagship of the Ferrari is capable of speeds over 340 km / h.
Another pleasant surprise is that in addition to praise the fastest and most powerful, Ferrari F12 Berlinetta is very economical. It consumes 10% less fuel than the Ferrari 599. Average consumption of F12 Berlinetta is 15 l/100 km and emissions - 350 g / km. These values ​​refer to the version of the system "start-stop." Body dimensions news - Length: 4618 mm Width: 1942 mm Height: 1273 mm. This means that the new 47 mm shorter, 20mm narrower and 63mm lower than 599. Wheelbase has also become smaller. Ferrari F12 Berlinetta Price is not reported, but the network has already sounded several times in the sum of 250.000 pounds. More information about the model will appear in next week when the new product will debut at the Geneva Motor Show.